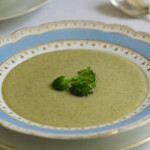 Love this Cream of Broccoli Soup Recipe….make and enjoy!!! Separate broccoli into stems and florets. Trim away the tough outer parts of the stems. Set aside 1 cup of the nicest-looking small florets to use as a garnish. Coarsely chop remaining broccoli florets and stems. Heat oil in soup pot over medium heat. Add onion, celery, leek, and chopped broccoli. Cook, stirring frequently, until the onion is translucent, about 6 to 8 minutes. Add the flour and blend well. Continue to cook, stirring frequently, for 3 to 4 minutes. Add the broth to the pot gradually, whisking to work out any lumps of flour. Bring the soup to a simmer and cook for 45 minutes. Stir frequently and skim the soup as needed. Strain the solids, reserving the liquid. Purée the solids, adding liquid as necessary to facilitate puréeing. Combine the purée with enough of the reserved liquid to achieve the consistency of heavy cream. If you wish, strain the soup through a fine sieve. Return the soup to a simmer. Meanwhile, steam or boil the reserved broccoli florets until just tender. Remove the soup for the heat and add the heated cream. Season to taste with the lemon juice, salt, and pepper. Serve in heated bowls; garnish with the florets.